The 356 ‘C’ model arrived in 1963 sporting disc brakes all round (first seen on the 2-litre Carrera 2), a new ZF steering gear and a compensating spring at the rear to calm the swing axle rear suspension. Engines options were the 75bhp ‘C’ and the 95bhp ‘SC’, both 1,600cc, the latter replacing the Super 90 model. In excellent and restored condition, this California example of the Porsche 356 ‘C’1600 Karmann Coupe was manufactured in May of 1964 and restored around 12 years ago with many upgrades. A new factory correct interior and full repaint in the original factory ordered Ivory white together with what appears to be a total mechanical overhaul was completed. The original engine was replaced in the 1970’s by the original owner who lived in the San Francisco bay area. 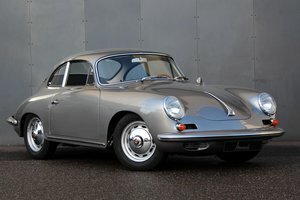 Purchased in 2015 and imported to the UK the Porsche was then sold to a UK collector who has stored the 356 in a climate controlled garage since. With minimal use, due to a large private and ever changing collection, this excellent Porsche 356 C comes to market having received a recent service and new battery to make it ready for immediate use. A wonderful 356 C for seasonal use, in excellent condition and complete with the factory owner’s manual.